It’s been such a fun and colorful journey designing this hexagon crochet blanket pattern, and I am so glad I got to share the process with you all. I absolutely love this pattern! Now that is has all come together, I wanted to share the final blanket and also put all the links in one easy to find place so you can make one too. The best thing about crocheting this hexagon afghan is getting to play with different color combinations. I chose a palette of greens, reddish browns, and blues. I was afraid it would be too busy but I love how the colors compliment each other. I included the specific color names and links in the materials list below in case you would like to a similar color scheme. I also think this pattern would work up great in a more monochromatic color scheme. The creative options are endless! With the yarn requirements above I made 217 full hexagons. You can arrange the hexagons into a rectangular afghan or to any shape or size blanket you like … think lap blanket, baby blanket, or bedspread! I thought it would be fun to make a large hexagon afghan out of hexagon! The size of my finished blanket was approx. 70 in. × 70 in. hexagon shape. The first step is to make the crochet hexagons. Make hexagons following the granny crochet hexagon pattern here, alternating colors after each round. The hexagons are stitched in all double crochets for three rounds. The fourth round is the edging round. I chose to join my pieces with the join as you go method (JAYGO) which joins the hexagons while working the fourth round. I wrote more on this step below. When laying your hexagons out before assembling you will notice there are some large half-hex shaped valleys between the full hexagons. You can create a straight edge along those sides of your afghan by crocheting some half hexagons to fill in those spaces. Don’t worry about the smaller peaks and valleys along the perpendicular edges right now … we will fill them in with our edging pattern as described below. As I mentioned above, since I already have a bunch of rectangular afghans, I thought it would be neat to make my hexagon afghan into the shape of a large hexagon (fun!). You can do this too or join them in any shape you’d like. I joined the hexagons using the Join As You Go (JAYGO) Method. In the JAYGO method, you join the hexagons while working the final round of the motif pattern … not only is it easy, but it also creates this beautiful design between your motifs! 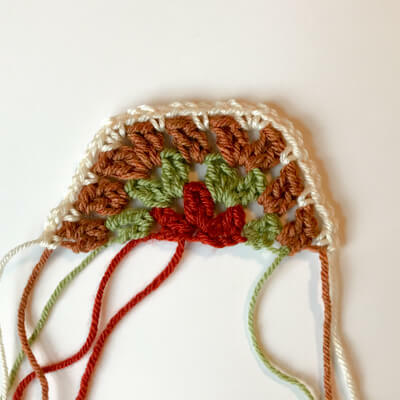 If you prefer a more invisible join, you can work the final round of the motif for each hexagon and then instead use this slip stitch joining method. Now that all your hexagons are joined together you are ready for your edging. 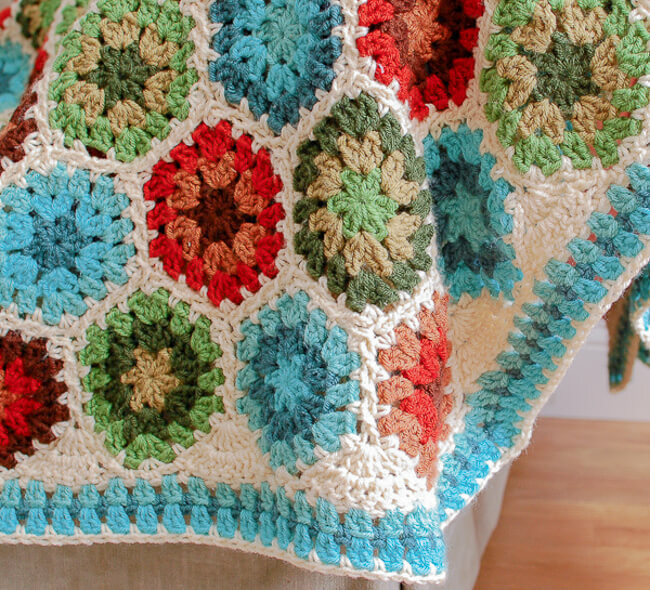 I designed this Granny Edging pattern that goes perfectly with the blanket style and also fills in the little valleys left between your hexagons for another pretty and straight edge. For my edging I chose my border color plus the three colors from my blue color palette. I have the edging pattern written out step by step but also included a stitch diagram for a more visual guide. Now it’s your turn! I can’t wait to see all the different colors and combinations you create. Snap a photo and show off your finished hexagon crochet blankets in my Facebook group here or on tag me on Instagram @petalstopicots. Oh how nice of you to send me the instruction site ..thanks so much I have mine about half finished , its going to be quite pretty , using red heart ..real teal for the center , gemstone for next rnd, then plume heather , put together with dark orchid.. Good color combo for me as I love purples in any shade .. Thaks again..
Gorgeous, thank you so much for sharing!! I’m currently using the pattern to make a baby blanket. Do you have any pictures of the full finished Afghan? I’d love to see what it looks like at a distance. Thank you so much, Niki! Also , how many of each color combo? I am in love with this just as it is and would love to know what yarn brand and colors are used. Thank you! I really love your hexagon blanket – it is truely lovely – I have never made a hexagon but you have inspired me to give it a try, thank you for the pattern and tute. Love the colour combo and the funky flower pattern!